Proven locally & demanded globally –Ezi-action® is the leader in chemical-resistant hand pumps for every industry. Since 1991, they have developed highly effective, lasting solutions to industrial problems. Now, A-FLO is a trusted supplier of Ezi-action® products, helping bring the unparalleled success into Australian industries. 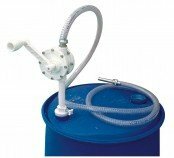 Ezi-action® Drumpumps are excellent for dispensing AdBlue, aggressive chemicals including acids, caustic and chlorine based chemicals, mild solvents, oils and lubricants including food grade lubricants. They are not suitable for dispensing strong solvents including hydrocarbon solvents. Hydrocarbon solvents includes petrol and D-Limonene ( greater than 10%). The pump presents superior quality, durability and features that surpass anything on the market today. Investing in this solution is a sound choice that will last for decades to come. Constructed from top-quality materials, the mechanical design is economical and streamlined, making for a swift manual transfer of fluids. 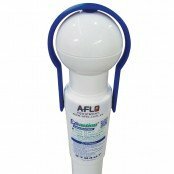 The Ezi-action® Drumpumps are made from FDA compliant, impact resistant polypropylene. The seals are FDA compliant LDPE and there is no requirement to change seals when dispensing different chemicals. Ezi-action® Drumpumps will dispense fluids up to 8000cpi. Colour coding with either a blue strap or an orange strap to differentiate to a fluid type is offered by AFLO. The unique design of the safety strap deters access by unauthorised users. 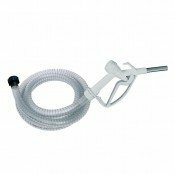 The spigot on the ergonomically designed ball handle locks the Safety Strap into place. Ezi-action® Drumpumps connect to containers, drums, totes, pails, IBCs–to provide you a solution for every situation. Being used in a wide range of industries across the globe: industrial, agricultural, food & beverage, janitorial, mechanics, truck drivers, garages, mining, cleaning and many more. We ensure each product we stock is made with the highest attention to your safety. Safety strap available in 6 colours: red (EZ-X0091), yellow (EZ-X0100), green (EX-X0080), blue (EZ-0067), white (EZ-X0353), purple (EZ-Z0108). 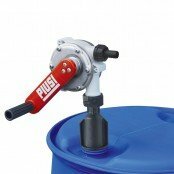 For further information about the drum pump and its applications, contact the A-FLO customer service team. You will experience friendly and warm relations and your question will be answered promptly.